ANNAPOLIS – Maryland’s top judge will address a joint General Assembly session on Feb. 6 to offer an assessment of the state of the Judiciary, a spokeswoman for the jurist said Wednesday. Court of Appeals Chief Judge Mary Ellen Barbera last addressed the Senate and House of Delegates in 2015, also at the invitation of Senate President Thomas V. Mike Miller Jr. and House Speaker Michael E. Busch. After Barbera’s 2015 speech, Miller said he welcomed the idea of Maryland’s top jurist addressing the General Assembly during the legislature’s first session following the quadrennial election, which occurred last November. 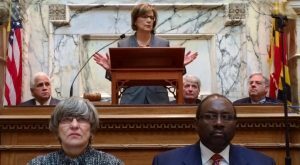 During her address four years ago, Barbera called for the legislators’ help as the judicial branch strives to use emerging technologies to make courts more accessible to Marylanders, especially those of low income or who do not speak English. Barbera was the first Court of Appeals Chief Judge to address the General Assembly since Robert M. Bell in 2005.